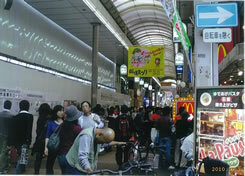 A Town of Traditional Osaka Shopping and Shopkeepers. Senba, known as the town of merchants, has more than 300 years of history behind it. Nowadays, the traditions continue with well-mannered merchants selling nice goods, at low prices. Baby goods, various sundries and miscellaneous items used in daily life can be bought cheaply here.